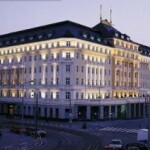 Radisson SAS Carlton has a delightful location by the Old National Theatre and in the centre of Bratislava. As you walk out the entrance door you are in the center of the city and shops, sights and restaurants can be found at once. It is easy to get to the hotel from the airport and the hotel offers their visitors an ATM inside the hotel and a fitness centre.